You are presented with incomplete pictures on the main screen, while the example image is shown on the right. By rotating the image, you can help Dotty in her UFO shoot blocks into the correct locations or shoot away blocks in the wrong place. 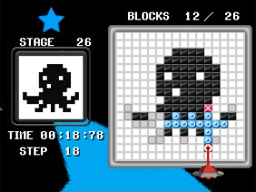 In the Puzzle Mode you have to clear each of the stages one-by-one, while in Time Attack the faster you complete stages, the more time is added to your timer.